Hiding your income tax refund in your sock drawer may feel handy, and locking it in your safe may feel secure, but putting it in the right savings or investment vehicle will make it grow. Americans expecting a refund on their 2018 federal income taxes anticipate they’ll get $1,861 back, on average, according to a new report from NerdWallet. More than any other goal, they’re earmarking that extra cash for savings — 46% plan on stashing the money away. But not all savings methods are created equal. The bottom line: You have several options for this annual windfall. 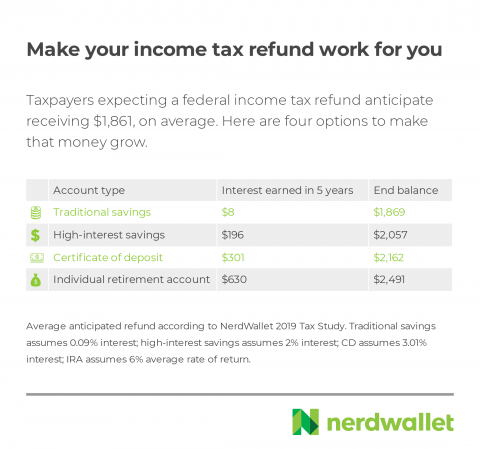 Using as an example that $1,861 average anticipated refund, here are four five-year scenarios that show how you could make the most of any refund you receive. Potential return: $8 after five years. Traditional savings accounts — those you find at big banks with a lot of branches — aren’t known for earning a ton of interest. Right now, the national average is 0.09%. If you squirrel away your refund and manage to leave it alone for five years, it could earn $8.39 in an account like this — not enough to write home about, but it may be appropriate if you want quick access to your funds and value visiting the bank branch in your neighborhood. With just over $8, you could take a friend out for coffee. Potential return: $196 after five years. Online banks are known for higher-interest savings accounts, and it’s not unusual to find one offering 2%. Opt for a high-interest savings account like this and you’re looking at a return of $195.55 after five years. If seeing a teller isn’t a top priority for you but you still want your money readily available, an online high-interest savings account is generally a step up from a traditional savings account. With an extra $196, you could cover one year of a premium streaming music plan for your entire family or just over two weeks of groceries, according to spending data from the Bureau of Labor Statistics. Potential return: $301 after five years. As with savings accounts, how much you can earn with a certificate of deposit depends on the bank you do business with. And like savings accounts, online banks typically offer better CD rates than traditional institutions. Putting your income tax return into a five-year CD with an online bank could reap you $301 in interest, assuming the current 3% interest rate. You risk paying a penalty if you need to withdraw from your CD before its maturity date. If you have an emergency fund elsewhere and know you won’t need these additional funds, a CD is a solid option for growing your money at a moderate rate. Just over $300 is nearly enough to pay the average monthly utility costs, according to the BLS. Potential return: $630 after five years. If you are without credit card debt and have an emergency fund in place, putting money toward your retirement is perhaps the savviest move you can make. Opening an IRA with $1,861 and letting it grow for five years could earn you $630, assuming a 6% average rate of return. But there’s a good chance you won’t be retiring in five years. Leave it in for 10 and you could earn $1,472; in 20, it could grow by more than $4,108. And with any luck, you’ll be able to add to that account — as you contribute more, you earn more for your golden years. Today, an extra $630 might afford you a year’s worth of high-speed internet. In retirement, you might prefer to spend it on plane tickets to see the grandkids.